The Golf is the most successful European car of all time. In launching the new e-Golf, Volkswagen is now bringing the bestseller onto the market as a full production electric vehicle as well. The especially agile and efficient compact car supplements the highly economic fleet of 3 Euro vehicles and boasts an extensive range of standard features. The e-Golf can be immediately recognised by its signature LED headlights and is available from €34,900. In launching the e-Golf, Volkswagen is bringing its second electric vehicle onto the market inside six months. The agile and efficient e-Golf impresses with best-in-class qualities from the off, leading the way with low power consumption of 12.7 kWh/100 km. In addition to the environmental aspect, the practically silent and thus gliding e-Golf is also very inexpensive to run, as power costs are just €3.28 per 100 kilometres. Thanks to a particularly innovative overall technological system, improved aerodynamics (cw=0,281) and perfected rolling resistance, the new, all-electric Volkswagen is over 15 per cent more energy-efficient than the best steel-built direct competitor. Joining the e-up! and eco-up!, the e-Golf thus extends the Volkswagen brand's fleet of highly efficient 3 Euro vehicles. 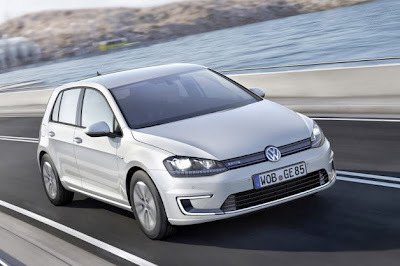 The e-Golf is 'Das e-Auto' - it has the same handling, comfortable ride and generous amount of space that has seen the Golf so appreciated for decades by over 30 million car buyers. The e-Golf is in addition fitted with a very good range of standard features, including four doors, the high-end 'Discover Pro' radio/navigation system, heated windscreen, automatic climate control, parking heater and ventilation, leather steering wheel, aerodynamically optimised 'Astana' alloy wheels and, being used for the first time by Volkswagen, full LED headlights. Another especially economic and likewise standard feature are the LED daytime running lights, which by virtue of their signature C-shaped format immediately identify the e-Golf as a Volkswagen electric vehicle. The electric engine delivers 85 kW / 115 PS and from a standing start develops maximum torque of 270 Nm. 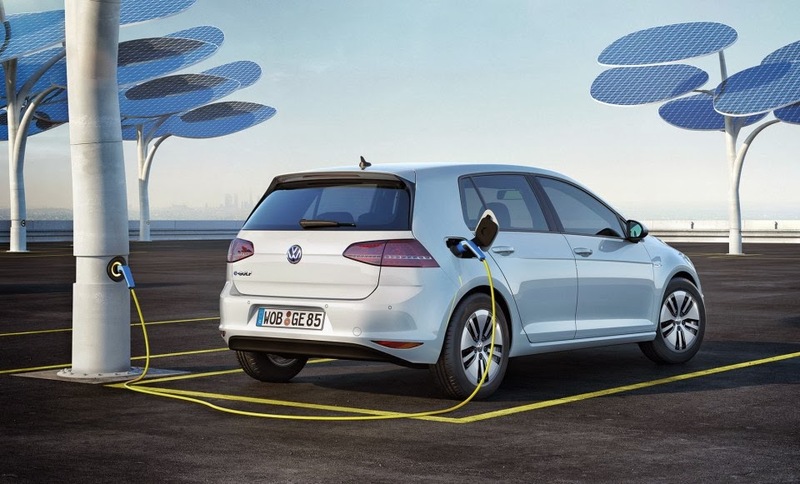 This deployment of power produces a superb driving performance: the e-Golf reaches a speed of 60 km/h within 4.2 seconds and after just 10.4 seconds the Volkswagen is up to 100 km/h. A fascinating factor here is the pull-away performance, which is extremely comfortable and totally free of any delay. Depending on the nature of the route, driving style and load, the range is between 130 and 190 kilometres. The new e-Golf is available in Germany now. Prices start from €34,900 (including the 8-year / 160,000-kilometre battery guarantee).